The Bahamas are a tropical paradise full of crystal clear waters and warm sandy beaches, not to mention the nightlife, water sports and chance to get away from it all. Bahamas cruise deals can be had by all of the major lines that service the Bahamas. Here are the top 10. 1. Cruises from Miami to the Bahamas—what a deal! The Norwegian sailing from Miami on September 3rd, 2012 visits Grand Bahama Island, Great Stirrup Cay and Nassau, all starting at $219 pp. This includes a $25 on board credit and a complementary bottle of wine. 2. Disney Cruise Lines 5-day roundtrip from Port Canaveral aboard the Disney Dream. The August 29th, 2012 sailing is on sale from $793 pp. Visit Nassau and Castaway Cay all while enjoying everything you love about Disney. 3. Carnival has an amazing Bahamas cruise deal at a last minute sale for the August 18th 2012 sailing. 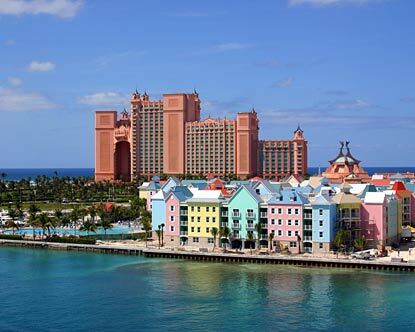 6-day roundtrip from Port Canaveral visiting Freeport, Nassau, and Half Moon Cay from $269pp. 4. Another offering from Carnival, a 4-day cruise from $179 pp., for the October 28th sailing leaving Port Canaveral for Freeport and Nassau before coming home to Florida. 5. Royal Caribbean’s Majesty of the Seas, from $344 pp. on the November 19th, 2012 sailing lets you enjoy Thanksgiving in the Bahamas. Includes a $50 on board credit and stops in Nassau, Cococay and Key West. 6. This 3-day cruise to the Bahamas from Carnival is offered from $199 pp. roundtrip from Miami, with stops in Nassau and Freeport. These rates are available for departures in November of 2012. 7. Bahamas cruise deals from Royal Caribbean include the 4-night outing from $299 pp. offered from July 2012-March 2013 on many sailings. Cruise roundtrip from Miami with stops in Nassau, Cococay and Key West. 8. Florida cruises to the Bahamas wouldn’t be complete without the 5-night Carnival offering from Port Canaveral. From $229 pp., this cruise stops in Freeport, Nassau and Half Moon Cay and offers deals on dates from July 2012-March 2013. 9. Royal Caribbean International offers 7-nights from Baltimore from $519 pp. on sailings from November 2012-March 2013. Enjoy all the things to do in the Bahamas when you stop in Nassau and Cococay. 10. The Disney Cruise Lines 4-night Bahamian cruise from Miami is offered starting at $500 pp. with sailings from January 2013-March 2013. Stops in Key West, Nassau and Castaway Cay. For deals, it is always best to shop around and see what is on offer, remember that last minute deals can also be had, for that awesome Bahamas cruise deal that is just waiting for you!